New Kingdom at its maximum territorial extent in the 15t century BC. 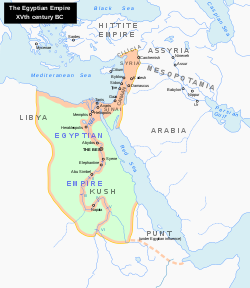 The New Kinrick o Egyp, an aa referred tae as the Egyptian Empire, is the period in auncient Egyptian history atween the 16t century BC an the 11t century BC, coverin the Aichteenth, Nineteent, an Twentiet Dynasties o Egyp. The New Kinrick follaed the Seicont Intermediate Period an wis succeedit bi the Third Intermediate Period. It wis Egyp’s maist prosperous time an marked the peak o its pouer. This page wis last eeditit on 13 Januar 2014, at 17:47.